Hockey is one of the many sports in which safety has become of the utmost concern in recent years. One of the most prevalent safety concerns remains concussions and other various head injuries, which result in devastating consequences such as Chronic Traumatic Encephalopathy (CTE), and have even been linked to early-onset Alzheimer’s Disease. Most of the big equipment companies have spent time and money partnering with affected players in researching new technology and equipment that can prevent injuries and improve player safety. 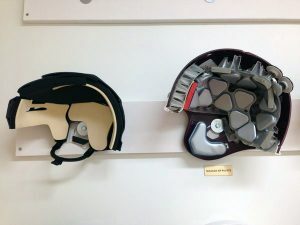 A major innovation in safety technology could come in the form of improved helmets, which, after all, protects the most important part of any player’s body. Although equipment companies appear to have taken initiative in monitoring and improving player safety in hockey of all levels, there still has not been a significant difference or decline in head injuries. This is mainly because hockey players desire a number of qualities in their equipment, including weight, style, comfort and even the brand itself. Especial in regards to helmets, hockey, being a sport which only adopted helmets in the 1970s, has been resistant in choosing protection over ease. Most players would not wear a helmet which was heavier than the one they currently wear, and certainly not if it looked less cool (hockey players are very concerned about style points). Additionally, players have been dealt a poor hand by companies, who have not actually made an effort in improving helmets. Virginia Tech professor and head of the biomedical engineering department Dr. Stefan M. Duma has instituted a similar type of testing for the university’s football team and later for hockey equipment companies, creating the STAR system, in which they perform lab and rink testing to determine the safety of helmets already on the market.3 An interesting aspect that the STAR system and the research of the ASME have in common is that they both haven’t really done anything to improve helmets, or any other equipment. This means that albeit having a better understanding of the helmet’s safety, the players are not necessarily provided anything safer than what they already have. 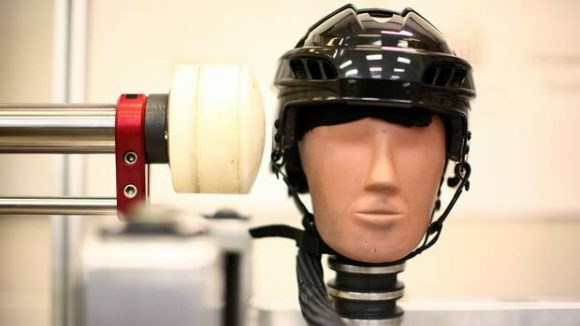 A new technological advancement for the sport of hockey which could actually impact and improve player safety could appear in the form of redesigned and reimagined helmets. Instead of pieces of plastic and foam, helmets could be made into concussion-proof barriers, with new resistance technology and half-face visors that display brain waves and vital signs after significant impact. The technology improvements would be as follows: three alternating layers of loose memory foam and encapsulated coolant gel (like in freezable ice packs), soft sensors with locations on the front, back and sides of the head to track brain waves and vital signs after a big hit to the head, and a visor that displays those signs with the touch of a button. It would do this by sensing the pulse and activity in the brain, just as a stethoscope does a heartbeat. This new, revolutionary technology would actually be an improvement among player’s choices now, and would be a welcome change to the suspiciously tired current research. These new and improved helmets would benefit the sport by rendering concussions and other head injuries less of a problem, as well as improving concussion protocol and providing an increased understanding and response rate to concussions. By implementing these helmets in the NHL, a player’s head hitting the ice could look a lot different than it does now. Say a player got into a fight with an opponent and one of them was thrown to the ice, hit his head and was knocked out. The trainers and EMTs would run over to the unconscious player, and immediately begin concussion protocol. To do this, they would simply click a button on the side of his helmet that would display a detailed reading of his pulse, vital signs and brain activity. Also to be displayed could be a rudimentary brain scan, as much as the small helmet technology would allow for, of course. The medics would notice unusual brain activity and wacky vital signs, so they would use signature hockey smelling salts to wake him up and keep him awake to perform other concussion protocol testing. From this, everyone in hockey would be able to see how this specific head injury was handled and how to help others in the future. Now, this all seems great for the sport and for the players, and carries a ton of potential. However, as with any new technology and innovation in sports, there would naturally be some opposition stemming from concerns about potential pitfalls and other variants of worry. The first and foremost challenge in implementing this technology would undoubtedly be getting the helmets to work, and to be effective and accurate, at that. It would certainly take significant amounts of research to make them practical, as engineers would have to learn how to make the helmets lightweight, durable and ultimately, functioning. 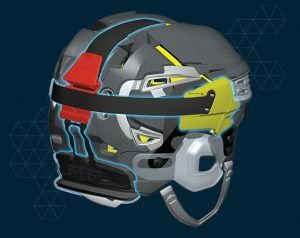 After implementing all the small computers and medical sensors in the helmet to accompany the foam and gel, it would take loads of testing and real-life application to convince players to get them. Another potential pitfall of this new technology could be the helmets malfunctioning or turning on when they are not supposed to, which could be a major distraction and general annoyance to players and staff alike. A similar problem to that could be the signs and statistics displayed on the helmet being inaccurate. A highly likely problem with this technology, inaccuracy could only be avoided with dutiful research and testing, even on real, active players before being widely manufactured. Taking these potential downsides and concerning negatives into account, the positives still outweigh them. Even if the technology had the potential or even the tendency to be inaccurate, it could always be improved upon and tweaked to provide more useful information. Also, it could not necessarily hurt a player, since with the layers of foam and gel acting as an unstoppable yet mobile barrier in and of itself, they would still be protected were they to suffer a threatening blow to the head. All in all, the upsides are more beneficial than the downsides are concerning. The long term impact this technological advancement could have on hockey is enormously positive. It could result in the lessening or ending of concussions and its effects like CTE, understanding of players with existing problems and how to prevent and treat them, advancements in neurological research, and general improvements in player health and safety. This technology could revolutionize the game, in making it safer and making the lives of players better without sacrificing the nature of the game. 1 & 2: John Varrasi, Fighting Hockey Concussions with Safer Helmets, www.livescience.com, (September 30, 2014).